Make your walks more enjoyable and stress-free for both you and your dog. This is our idea to present our newest HUMANE NO PULL HEAD COLLAR. This headcollar imitated from traditional horse halter-where the nose goes,the body will follow. When the headcollar is on, It removes his natural tendency to pull on the leash by placing gentle pressure on calming points and eliminating uncomfortable pressure on the throat. Pressure is applied to the back of the neck (rather than the front) reducing your dog's drive to pull forward. 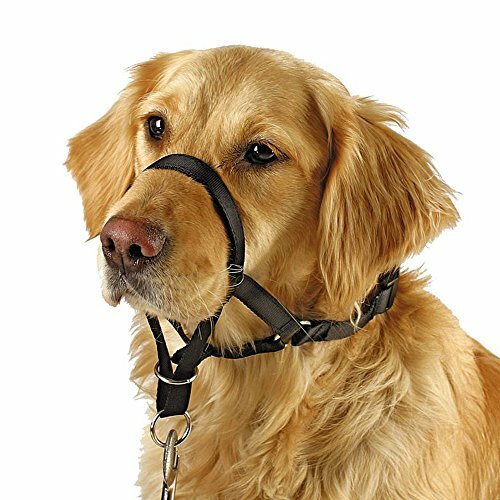 This headcollar stops excessive leash pulling and reduces other unwanted behaviors and is regarded as an ideal gear for dog training. S- Snout Circumference: 3.1-7.8"; Neck Strap: 11-13"
M- Snout Circumference: 4-10"; Neck Strap: 13-15.7"
L- Snout Circumference: 4.7-12"; Neck Strap: 15-19.7"
XL- Snout Circumference: 6-13.4"; Neck Strap: 17-22.8"
XXL- Snout Circumference: 7.1-15"; Neck Strap: 19-25.6"
Recommended for walking purposes only. Do not leave the halter on dog unattended. Not to be used as a tie-out. We are offering an 100% MONEY BACK GUARANTEE if you are not satisfied with any of our products. So what are you waiting for? Scroll up and add it to cart! For more information on this item, feel free to email us. If you have any questions about this product by Barkless, contact us by completing and submitting the form below. If you are looking for a specif part number, please include it with your message.